Watch out, 'cause here's another installment of WFN's Top Catches! If there's a theme to this weeks videos, it's that encounters with nature can be fun, mysterious, or even scary. Apparently man’s best friend can also be a fishing buddy, as seen here in this cute video of a golden retriever that is determined to catch a tarpon all for itself. Kudos to the anglers to have the patience to reel in a decent-sized tarpon around a curious dog that refuses to get out of the water until it gets a hold of the fish. The best attacks come towards the end of the video, but it’s a great watch throughout. As if participating in an Ironman competition wasn’t gruelling enough as it is, a huge shark (or possibly a pilot whale) decided it felt like swimming right in the middle of it! If you watch closely to the top left of the screen, you’ll see the shark jump out of the water. While thankfully no attack transpired, it must be a little horrifying for competitors in Australia to see this footage. Now here’s an interspecies close encounter that’s a little ore heart-warming than sharks and humans. There have been several recent observations in Hawaii of bottlenose dolphins actually playing with humpback whales. As the video explains, the whales lift the dolphin out of the water with their head and then the dolphins slide back down. Then repeat the process. It’s no secret that whales and dolphins are more intelligent than most animals, but it’s still quite the site to see them have the capacity to cooperate and play together. A short video, but it still serves as a great reminder this time of year for those who like to ice fish. Just because there are other vehicles on the lake, doesn't mean every spot is safe. Trucks falling through the ice happen every year. The cameraman really delivers the only punch line needed for such a scenario. Despite the title, this isn’t so much a “How to” as it is a “What the…! ?,” especially for the twist ending. The artist, Dan Reeder of Seattle, clearly has quite the talent for paper mache, and there’s no questioning his attention to detail once you see the finished product. Best part of it all? The surprise attack at around the 1:20 mark! 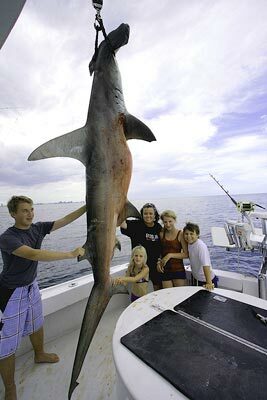 Rosie O'Donnell and her family pose with a hammerhead shark. TV personality Rosie O'Donnell has recently come under fire from conservationists after a photo of her posing next to a dead hammerhead shark near florida surfaced earlier this month. Even though the photo was taken years before the Jan. 1 ban, the well-known philanthropist has had to face a lot of questions regarding her trip. So much so she made a mock public service announcement addressing the allegations during her show.